I got my 91 SS dyno tuned by Harvey at The Boost Creep Ltd. This is on a stock longblock with 230K and crappy 22t heads. I'm running the vf39 with 550cc injectors at 17psi tuned with the pp6. Made 270ftlbs and 240hp...the torque is expected but hp seems good for the heads. Wow... Those are some really good numbers! Very nice! So you just have a stock ej22t with a new turbo at 17psi? I'm just asking because that seems too good to me for that. Those numbers seem reasonable. The 22T heads are capable of making some power. Just not as much as other options. I was making around 300 with the 2871R and Delta cams. That's awesome. Guys remember dyno results vary from dyno to dyno. I am running the 550cc Sti injectors, which allow the good match for the vf39. I also have a ton of other mods, but those are mostly supporting and don't have much to do with the power output. The dyno this was done on is comparable to the other shops in the mile high area. I am super happy with this setup for the moment. The car feels pretty fast. I was making 240tq and 180hp with the td04 at 16psi, so it's a good increase for just the vf39. This gives me some time to enjoy this power while I build my 2.35L stroker. I will be starting a build thread for that shortly. One thing to keep in mind for this setup is the intercooler. The 06 WRX TMIC I am running is too small with the vf39 at 17psi. It definitely heat soaks and it was evident. When we did 4 pulls on the dyno in a row, each pull lost between 5-10 hp. When we let the car cool off for 20-30 min, the next pull was always good. I actually saw 280ftlbs and 245hp on one of the pulls, but the curve was more choppy, so we didn't print that one. I am now looking into running a FMIC. wait, swapping from a td04 to a vf39 with the tune alone gained you 60hp and 30tq? I wonder how meth injection helps? Or a IC sprayer. I did install a lightweight flywheel in between the td04 and vf39....so that might account for some to the wheels power increase. The rest of the improvement is from the vf39 and re-tune. holy crap, i just didn't expect THAT MUCH of a power increase over the TD04, is it a pretty agressive tune? also, im guessing thats AWHP? Wow! Looks like it actually holds ~240 hp all the way to redline, too! Feels like it pulls hard all the way now. Before, with the td04, it dropped off up high. looks good! Ya the stock heads can yield good numbers. 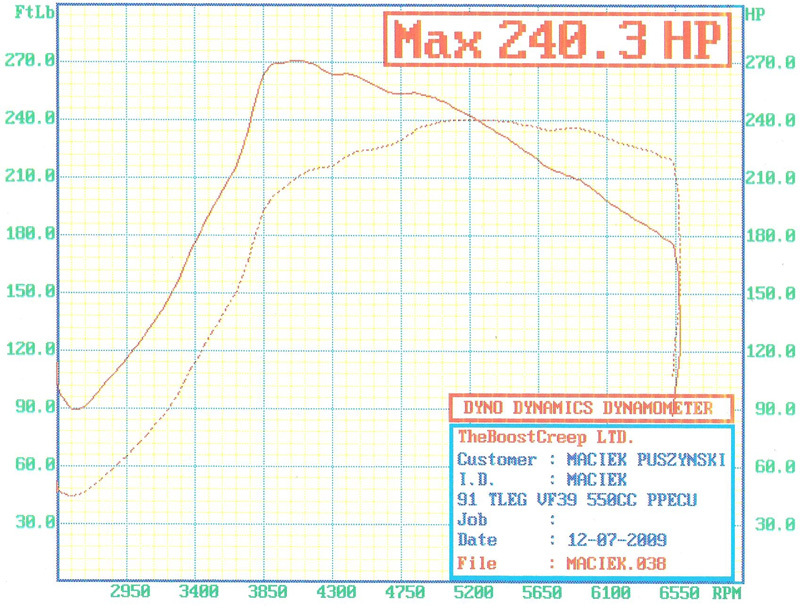 my car did 200whp 200ft/lbs on a dynojet @ 10psi w/ a 16g. can u post ur full mod list. im curious if certain parts were used in addition to the vf39, sti injectores, wrx tmic and ecu. ie: exhaust, headers, catless, fuel pump, intake, stock or aftermarket clutch... etc. what other parts do u have? im very impressed with these numbers thats why i ask... thanks. The tuning was done by Harvey, who owns his shop....The Boost Creep Ltd. He has been around for a long time in the Denver/Boulder area and is a very reputable tuner. wow, really nice. so no major engine work whatsoever. why the change in fuel rails? and i just clicked ur link. nice build u got goin there. good luck with it. The 92-94 N/A fuel rails allow me to run the USDM STi 550cc injectors.